When a buyer decides to make an offer on your home, they usually make the decision with their heart, not their head. Buying a home is an emotional decision, and smart sellers will leverage this information to make the quickest sale for the highest price. 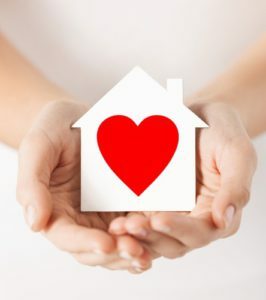 Just in time for Valentine’s Day, here are our best tips for how to make buyers fall in love with your home. In today’s real estate market, most buyers begin their home search online. For this reason, it’s essential that you have great photos for your listing. Put yourself in the buyer’s shoes. What kind of photos would you like to see of a potential new house? Make sure photos are well lit, rooms are clean and all your home’s qualities are emphasized. Once a buyer has browsed through the online listings, they’ll determine which houses they’d like to see in person. But just because they found something they like in the listing, doesn’t mean that feeling will automatically transfer when they show up to your front door. First impressions count. You only have a few seconds when the buyer arrives at your house to make it look inviting. They will assume what they see on the outside will be reflected inside. Take time to give the exterior of your home a facelift so that it has the best possible curb appeal. Clean up the yard, trim trees and bushes, plant annual color, power wash the outside and give the front door a fresh coat of paint. To make buyers fall in love with your home, you must make it easy for them to imagine living there. That can be difficult if there’s a giant framed photo of your grandmother staring at them, or worse, sports paraphernalia from an opposing team. Give your home a thorough cleaning and remove clutter, including bulky furniture. Take down all family photos and store all personal items. Your home should feel fresh, clean, spacious and neutral. In order to work on a buyer’s emotions, you must appeal to their senses. Fill the air with good scents, like fresh flowers, baking cookies or brewing coffee. Set out some light snacks and drinks. Play some soothing, ambient music. Use fabrics with a variety of colors and soft textures for beds, couches, curtains and tablecloths. You want to make your home feel warm and inviting and leave potential buyers feeling relaxed and happy. One of the most important details that will move a buyer from “like” to “love” is offering your home at just the right price. Do you homework and research comps in the neighborhood. Talk with your real estate agent about how to best price your home to sell – not too low, not too high. You want to hit it right at the sweet spot, which an experienced agent can help you do. Are you ready to make buyers fall in love with your home for sale? Then follow these tips and you’ll be on your way to closing day.